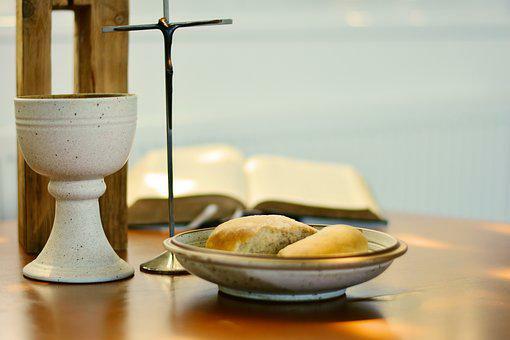 The Sacrament of Holy Communion is the celebration of the relationship United Methodists and all Christians share with the risen Lord, Jesus Christ. On the night before Jesus died he said, “Take, eat; this is my body which is given for you. Drink from this, all of you; this is my blood poured out for you.” The simple act of eating bread and drinking grape juice allows us to share in His life and connects us to the love and power of God. The sharing of the holy meal is known as Communion, Holy Communion, or the Lord’s Supper and is served at the altar rail. There is a continuous serving until all who wish to partake have come. As United Methodists we celebrate an open communion table, meaning that all persons who come by faith in Christ are welcome at the table. And if it is difficult to come forward, simply signal the usher and we will bring the elements to you in the pew. At our church, the Lord’s Supper is offered at a variety of times. Holy Communion is served at the altar rail on the first Sunday of each month. Holy Communion is serviced by Intinction the third Saturday of each month. Holy Communion is served at 10:30 pm Christmas Eve service. Holy Communion is served on Ash Wednesday. Holy Communion is served at worship services on Maundy Thursday. Holy Communion is served at worship service on Good Friday.